Nine people have been charged after drugs raids by 160 police officers in Liverpool and Torquay. Five Liverpool men, three Torquay men and a man of no fixed address were charged with conspiracy to supply class A drugs. 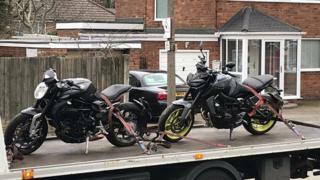 Large quantities of cash, drugs, vehicles worth about £40,000, including motorbikes, and a stun-gun were seized on Thursday. All the accused, aged 20 to 57, are due to appear before Plymouth magistrates. The charges relate to the alleged supply of drugs from Liverpool to Torquay between 1 November 2017 and 21 March 2019.